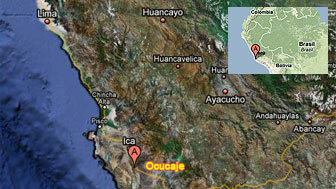 Fossil of 10 million-year-old bird found in Ocucaje, Ica, Peru. Elearning. LIMA, Peru (AP) — The unusually intact fossilized skull of a giant, bony-toothed seabird that lived up to 10 million years ago was found on Peru's arid southern coast, researchers said Friday. The museum said in a statement that the birds had wingspans of up to 20 feet (6 meters) and may have used the toothlike projections on their beaks to prey on slippery fish and squid. But studying members of the Pelagornithidae family has been difficult because their extremely thin bones — while helpful for keeping the avian giants aloft — tended not to survive as fossils. 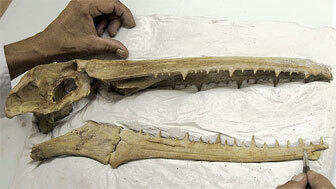 "Its fossils are very strange, very rare and very hard to find," Salas told The Associated Press. "Rarely are any bones of these gigantic, marine birds found fossilized uncrushed, and to find an uncrushed skull of this size is very significant," said Ken Campbell, curator of vertebrate zoology at the Natural History Museum of Los Angeles. Campbell, who examined photos of the find but was not involved in the dig, said he knows of "no specimen of comparable quality." Dan Kepska, a paleontology researcher at North Carolina State University who also was not part of the project, agreed that the skull is the most complete ever reported. He called the birds "one of the great enigmas of avian paleontology." With fossils discovered in North America, North Africa and even Antarctica, Kepska said, the birds were ubiquitous only a few million years before humans evolved and scientists puzzle over why they died out. Some believe they are related to gannets and pelicans, while other say they are related to ducks. Campbell said the Peru find "will undoubtedly be of great importance to our understanding of these gigantic birds, and it will help clarify the relationships of the other fossil pelagornithids found in the Pisco Formation." The formation, a coastal rock bed south of the capital, Lima, is known for yielding fossils of whales, dolphins, turtles and other marine life dating as far back as 14 million years. The well-preserved, 10-million-year fossil cranium of a large, toothed seabird was found in Peru's southern Ica region, a spokesman for Peru's Museum of Natural History said Friday. "The skull of the giant bird with teeth, measuring 40 centimeters (16 inches)" was found a few months ago by paleontologist Mario Urbina in a rock strata, said Rodolfo Salas, adding that it is 10 million years old. The fossil is of the prehistoric seabird Pelagornithidae, which had wing spans of up to six meters (20 feet) and a large bill with tooth-like projections. It lived between the mid-Paleocene and Pliocene periods 60 to three million years ago.